2 drawings on paper, lined and laminated (1 sheet) : ink ; left image 4 x 2.75 in., right image 4 x 2.75 in., on sheet 6 x 9.5 in. 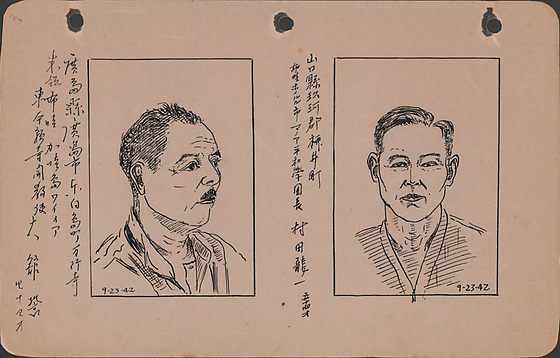 Ink portraits of two men, Chikai Odate and Ryuichi Murata, in Lordsburg Justice Department Camp, New Mexico on September 23, 1942. Both drawings have black line border. Left portrait of Chikai Odate of Higashi Hongwanji on Kauai, Hawaii, originally from Hiroshima, Japan. Turned right at three-quarters view, Odate wears a button-down shirt over another shirt. He has a small mustache and a receding hairline. Visible from shoulders up. Right portrait of Ryuichi Murata, a 54 year-old principal of Manoa Heiwa gakko in Honolulu, Hawaii, originally from Yamaguchi, Japan. He is dressed in a v-neck top facing the viewer. He is cleanshaven and his hair is parted on the proper left. Visible from shoulders up. Written in black ink on left image: 9-23-42. Written in black ink to left of left image (In Japanese): Hiroshima Hiroshimashi [unreadable] / Beiryo Hawai Kauai to WAimea / Higashi Hongwanji Kaikyoshi Odate Chikai [44 sai]. Written in black in on right image: 9-23-42. Written in black ink to left of right image (In Japanese): Ymaguchiken Kugagun [unreadable] / Hawai Honorurushi Manoa Heiwa Gakkuen cho / Murata Ryuichi 54 sai. Written in pencil, top left corner: 147.